One of the most interesting aspects of the gaming world over the last few years is the possibility to play multiplayer games. It's not a new function: back in the 90s' there were already gamers that got together to play on their PCs connected to a local network to enjoy titles that offered something else beyond their limited AI. However, thanks to modern Internet connections you no longer have to carry your computer around with you. In fact, you don't even need a PC if you've got a smartphone. 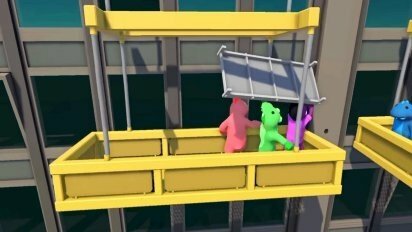 Gang Beasts is a crazy fighting game in which the only requirement is to have somebody to play with online. There are several versions for PC, PS3 or PS4, but those that have been developed for smartphones are also a success, as is the case is this Android game. Its APK can be downloaded totally free of charge (unlike its official version for Windows that you can purchase on Steam) and it offers us a mad battlefield with all sorts of crazy characters. Anthropomorphic dragons and chickens are some of its main characters and anything is valid in this all-versus-all in order to reach your goal: kick your enemy off the scenario. 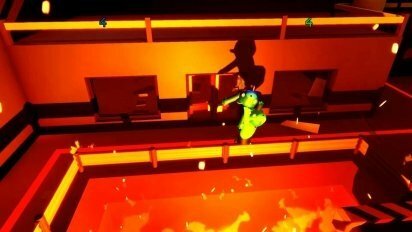 An atypical fighting game that you're going to love. For such purpose, you can use any technique, blow or combo that you can think of and all the elements of your surrounding can be used to damage your enemies or to be damaged. 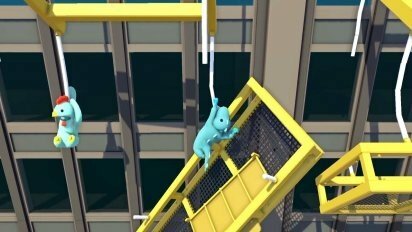 Elevators, platforms, vans, chains or rocks: make the most of them all taking into account the most basic laws of physics. And this is also important: it doesn't matter how good you are controlling your fighter because there's always something that will throw you off your balance, even a simple slip up. The really important thing is to be as creative as possible when it comes to kicking and punching the hell out of your rival. It's a perfect game even for those users that aren't too used to playing fighting titles. But remember that there's one essential requirement: you need to have friends to play with.